Students at Kuruman Campus are encouraged to maintain a balanced lifestyle. Participants in various activities can help to achieve this. Culture: Events at Kuruman Campus provides opportunities in various fields of talent competitions. Kuruman Campus is one of the strongest campuses in the area. The lecturing staff is dedicated and get exceptional results with the students. Kuruman Campus is a well equipped training facility with the best equipment money can buy. Kuruman Campus has a student support division that takes care of our students. When a student is not performing to his maximum or stay out of class the student support is notified and they follow up on our students. They also provide counseling, job opportunities and bursary services for students. Kuruman Campus is recognised by the SA Government as one of the most reliable and trusted institutions offering courses that are relevant to the needs of South Africa. Kuruman Campus will assist you to overcome a variety of difficulties and will make you see your true potential as a person and enjoy life! The Campus is located in Town and our beautiful building is iconic to Kuruman. We take great pride in keeping the building in tip top condition. 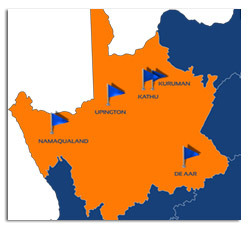 Kuruman Campus Staff was hand picked for each course and constantly trained in the latest teaching techniques. All classrooms are equipped with data projectors and most lesson include very descriptive and entraining videos. Lecturers are evaluated on a monthly bases to ensure quality education.